Perfect for taller dogs, Owens Products Hunter Series Dual-Compartment Tall Dog Box with Top Storage features rugged diamond-tread aluminum construction and offers two dog compartments to keep your best hunting buddies comfortable. Each compartment offers lockable slam-latch doors for added pet safety. Four-season oversized side and rear vents with storm covers ensure your pets stay cool when the weather heats up. Premium rattle-free spring loaded carrying handles makes transporting easy. Full-length top storage compartment with a pull-strap closure is great for storing guns, electronics and hunting gear. Made in USA. 45”L x 38”W x 32”H. 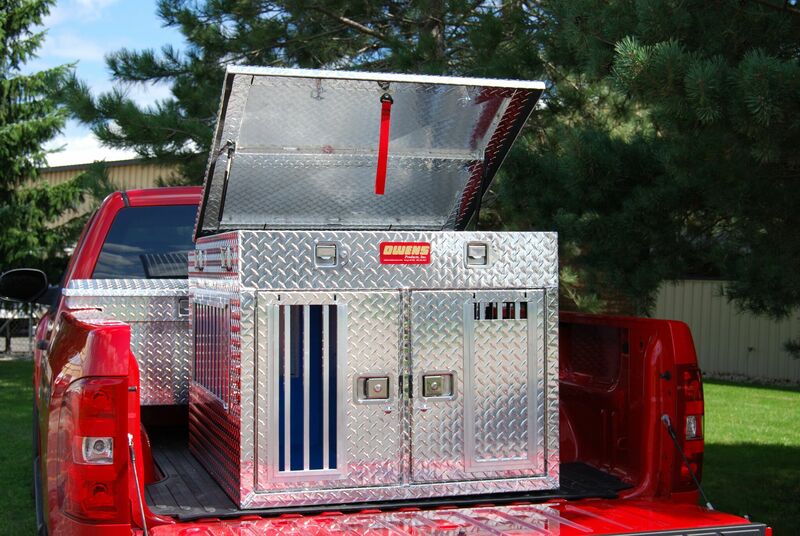 Dog compartment: 44"L x 24"W x 24"H.
Storage compartment: 45"L x 48"W x 6"H.